A match-winning 101 runs 7th-wicket stand in 70 deliveries, between Shalika Karunanayake (68 in 40 balls with 8 sixes and 1 four) and Sachithra Senanayake (67 in 45 balls with 6 sixes and 4 fours) propelled Teejay Lanka to a comfortable 82 runs win, on DLS method, over (LBF), in the 25th Singer-MCA Premier League 2018 Knockout Tournament Final, concluded at the MCA Grounds last Sunday. The match was reduced to 42 overs a side, as it commenced late at 11.30 am, due to soggy ground conditions, . 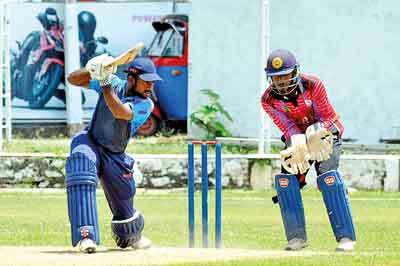 Teejay Lanka, sent into bat, was in a spot of bother, losing their top order batsmen, Nilushan Nonis (7) Kithruwan Vithanage (5) and Milinda Siriwardena (4), cheaply, as the LBF spinners Sahan Arachchige and Charith Sudaraka were bowling well in tandem- 116/6 in 23 overs. While wickets fell at regular intervals at one end, Teejay opening batsman, Dilan Jayalath stood tall with a solid 51 in 62 balls, with 3 sixes and 3 fours. Teejay failed to utilise their full quota of overs, being all out for 266 in 38.4 . LBF started their run chase on the wrong foot, losing their openers Shasheen Fernando (8) and Lahiru Udara (6) and were 15/2 in 6.1 overs. With the board reading 67/4, in the 16th over, darkness engulfed the grounds. Twenty overs had to be completed to constitute a result, and LBF was lagging by 57 runs on the DLS chart. By the 28th Over, LBF had lost 2 more wickets at 94. That of skipper Lakshan Rodrigo (9) and Chathuranga Kumara (7), both falling to skipper Lasith Malinga (4-0-2-3) who bowled slow, starting two steps from the wicket. By the 25th Over, with thunder and lightning, Umpires, Ranmore Martinez and Ruchira Palliyaguru, decided to call off play at 4.20 pm, with LBF reeling at 125 for 7, short by 82 runs as per DLS. Sachithra Senanayake who opened the bowling for Teejay and got the vital wickets of Shasheen Fernando, Kusal Mendis and Sahan Arachchige, finished with impressive figures of 9-1-35-3. Match Referee Basil Perera picked Shalika Karunanayake of Teejay Lanka, as his Man of the Match. 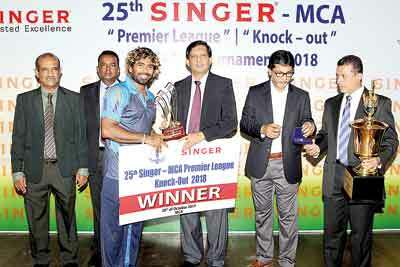 Awards for the ‘League’ and ‘Knockout’ were presented by Singer Sri Lanka PLC Marketing Director Kumar Samarasinghe (Chief Guest), Singer Sri Lanka PLC Senior Promotions Manager K.D.S. Kanishka (Guest-of-Honour), former MCA President Adel Hashim, MCA President Roshan Iddamalgoda and MCA General Secretary Nalin Wickremasinghe.